India is a host to innumerable customs and rituals but, kanyadan in the Hindu marriage is considered the most important among them. This ritual has an underlying significance which has been passed down through generations since the time of Vedas. But, some of these rituals have been modified along the way, giving rise to something completely new. 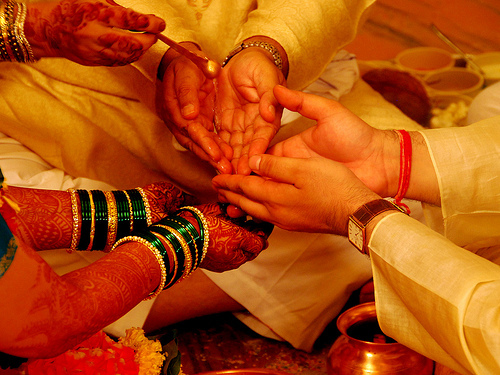 Kanyadan in the Hindu marriage is highly valued. The literal translation of the word ‘Kanyadan’ comes down to – Kanya=Maiden and Dan= Donation, which means donation of a maiden. 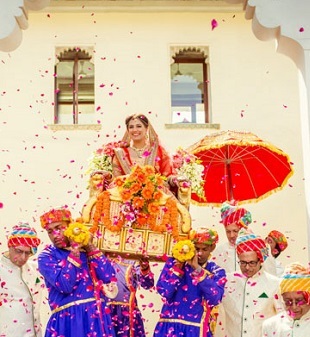 The groom is considered to be an incarnation of Lord Vishnu and the bride is considered to be a form of Goddess Laxmi, the symbol of wealth and prosperity. 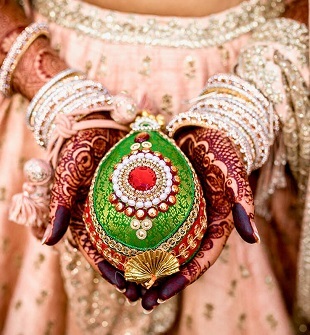 So, the father hands over all his rights and duties towards his daughter to the groom. Kanyadan ceremony marks the biggest transition in a woman’s life. The ceremony confirms the change of role in her life, from a daughter to a wife. She moves from a secure environment of her father’s to a new place. Fasting is mandatory to perform this ceremony. It is done by bride’s father or some other elder member of the family. Traditionally, it is not allowed to eat or drink anything before the ceremony is performed. Now, after the varmala ceremony i.e. exchange of garlands between the bride and the groom, the bride sits on the opposite side of the groom in front of the holy fire. Then on the right hand of the groom, bride’s right hand is placed. This ritual is known as hastamilap or joining of hands. After this, their hands are joined together with a thread or a red cloth, betel nut, betel leaves and flowers are placed on top. Sometimes gold coin or money is also included during this ceremony. Then, father or both the parents place their hands on top of the joined hands of the groom and the bride. After that, gangajal is poured over the hands, all the while repeating the mantras chanted by the priest. The groom then places his free hand on the bride’s right shoulder, which symbolizes him taking all the responsibility of her wellness and happiness. They are now tied together in a bond. 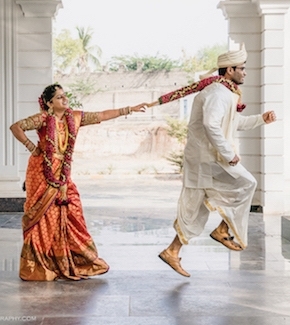 The bride is no longer a part of her father’s home but rather, belongs to the groom’s family. Then the couple proceeds for the saat pheras. Kanyadan in the Hindu marriage is considered to be the biggest dan or offering that an individual can do. It is believed that kanyadan cleanses the soul of the person. The idea is that the bride’s father gives away his daughter to the groom. During the wedding, groom becomes the personification of Lord Vishnu and bride the personification of Goddess Laxmi. On the other hand, it is believed that the parents are entrusting the groom with their daughter. It is expected of the groom that he will take care of their daughter and keep her happy in every possible way he can. The groom promises to fulfill the three basic needs of needs of their daughter- Dharma, Artha and Kama. The father officially hands over all his rights and duties to the groom. The groom accepts his responsibility towards the bride. Kanyadan is a relatively a new concept. Earlier Vedas did not have this concept. 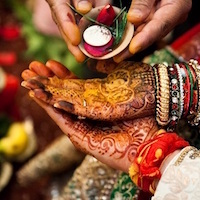 During the Vedic times, woman’s consent for marriage was of utmost importance. It was her choice whom she wants to marry. In a marriage, a woman and man were considered equal. The custom of a father offering his daughter was unheard of. But, as time passed Vedas evolved and gave rise to manu smiriti – the foundation of Hindu laws. It highlights the do’s and don’ts of a Bhramin life and their dharma. After manu smiriti was accepted as the basis, the position of a woman changed. The women were stripped of the independence that they enjoyed at the Vedic times. They were placed under the lifelong male guardianship- father when unmarried, husband when married and son when old or widowed. So, this marks the beginning of this ritual. Hope you got to know a lot about Kanyadan. For Update on more Wedding Traditions Stay Tuned!